Draw control specialist Alyssa Leonard cheers after Northwestern's final goal in its win against Southern California. The senior kicked off her last regular-season game's second half with a behind-the-back goal. 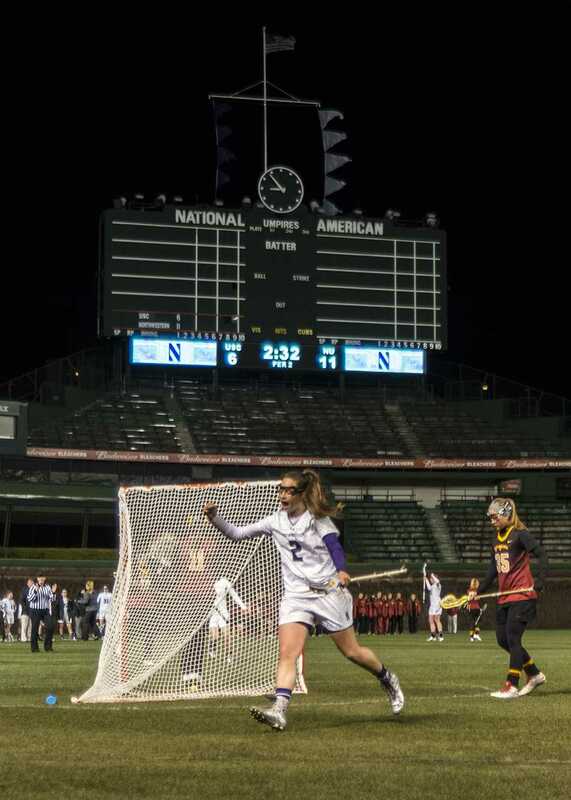 It took 12 years and seven national championships, but as purple and white flags fluttered against a dark Wrigleyville skyline, Northwestern women’s lacrosse officially cemented its national presence. After three games at three nationally significant stadiums — Cowboys Stadium in 2011, Gillette Stadium in 2012, and the Los Angeles Coliseum in 2013 — Northwestern returned home to Chicago on Saturday to conquer the last corner of the nation at Wrigley Field. With 5,145 fans in attendance, the Wildcats neatly handled the visiting Southern California program under the lights of the Friendly Confines, 12-7. The significance of the landmark Chicago location wasn’t lost on coach Kelly Amonte Hiller, who largely pioneered the sport’s expansion when she restarted the varsity program 12 years ago. Goalkeeper Bridget Bianco spoke afterward about the experience of playing at the 100-year-old park. There was no question as to whether the Cats felt comfortable in their temporary home away from home, as draw control specialist Alyssa Leonard proved coming out of halftime. The senior kick-started the second half of Saturday’s game with a showy, behind-the-back goal. The play was something the controlled, reserved Amonte Hiller might usually dislike and exactly what could be expected from a graduating senior playing the last regular-season game of her career in a historic ballpark. Leonard led the dominance of the senior class, which collectively scored 7 goals. The draw control specialist scored a hat trick, coming in just under junior attack Kara Mupo’s 4 goals, the team’s highest. Aside from Mupo and a goal from Jess Carroll, the fruit of the junior’s five shots, seniors made up the rest of the score sheet. Senior Kat DeRonda chipped in 2 goals, and her classmates Kelly Rich and Christy Turner each notched 1. Carroll and Mupo, as they did against Florida on April 19, showed promise as leaders heading into the post-season. The Cats now turn their focus to the ALC Tournament, which the team will host at Lakeside Field starting May 1. With three losses within the conference, Amonte Hiller said her team is looking forward to making its mark in the last tournament before the conference disbands. Perhaps the Cats’ purpose this year is what makes NU fit in as a Chicago sports team. Because if there’s one thing Wrigley Field has done in its 100 years, it has hosted many teams ready to prove themselves against expectations.